Whenever I’m headed to a tailgate, I always like to pack easy tailgate foods that I can set right out and enjoy. 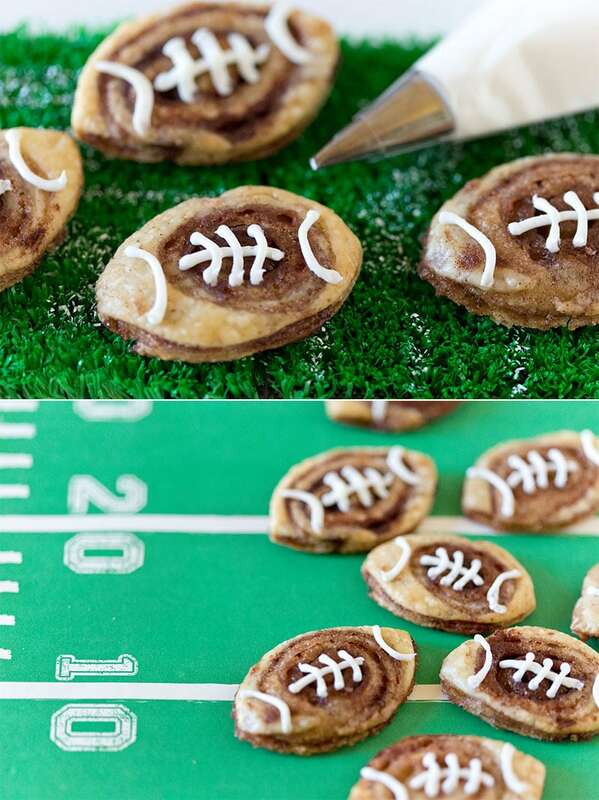 These football cookies are the PERFECT Football Party Food; easy to make, sweet and delicious, and shaped like footballs! 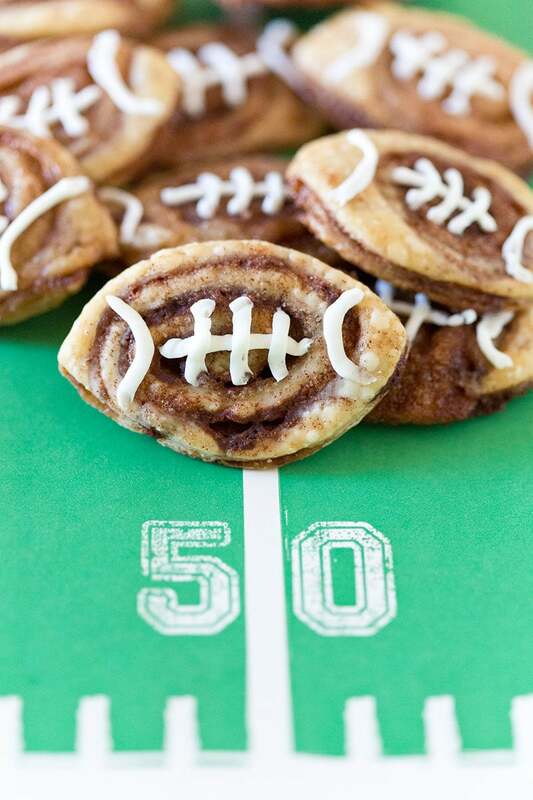 If you make these football cinnamon roll cookies (are you listening closely? ), you MUST…MUST…put them in your to-go tailgate container immediately, or you risk eating them as you head out the door. Then you’ll HAVE no football cookies. No, seriously. They’re that good. Or double the batch if you want any left by halftime! This cute recipe for football cookies is fun for the kids to help make (or your husband) and it’s always a crowd pleaser! They’re a twist on a favorite childhood recipe using extra pie crust and cinnamon sugar. The swirls of cinnamon buttery goodness are SO good. And football laces? Too cute and easy, y’all! I know how it is to haul a bunch of stuff to a tailgate, and fussy foods just won’t do. Easy tailgate foods are key, these football treats are perfect. A delicious and easy tailgate food that's perfect for the big game! Roll out pie crust and brush with softened or slightly melted butter. Be sure to spread butter evenly to all edges. Roll pie crust lengthwise into a tight long roll. Use a sharp knife to cut 1” rolls. Lay each roll flat and use the bottom of a large glass to flatten to about ¼” thickness. Use a knife or cookie cutter to cut out football shape from flattened roll. 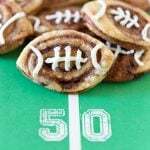 Bake all football shaped cinnamon rolls for 10-15 minutes or until slightly golden (this depends on thickness and size also so watch carefully). Whisk together powdered sugar with milk and vanilla extract to make a thick glaze. You can also use vanilla frosting. The key is a thick glaze that won’t spread when piped. Pipe on the lace design to resemble a football. Here are a few photos of making the football cookies. They’re very easy and kid-friendly if you have a little chef on your hands. I know my daughter Blakely LOVES to help me make these for game day and tailgating! You can make this football party food a day ahead. Just store them in a single layer so the icing does not get messed up. These are a great treat to package together as a hostess gift if you’re headed out to watch the game! You can even pipe the laces in your team’s colors! Just use food coloring to tint the icing. For a twist on this recipe, make one large football cinnamon roll by placing the cinnamon rolls together and using a rolling pin to flatten out the rolls as one large piece. Use a knife to cut out a large football shape and bake accordingly. Pipe on the large laces and enjoy! 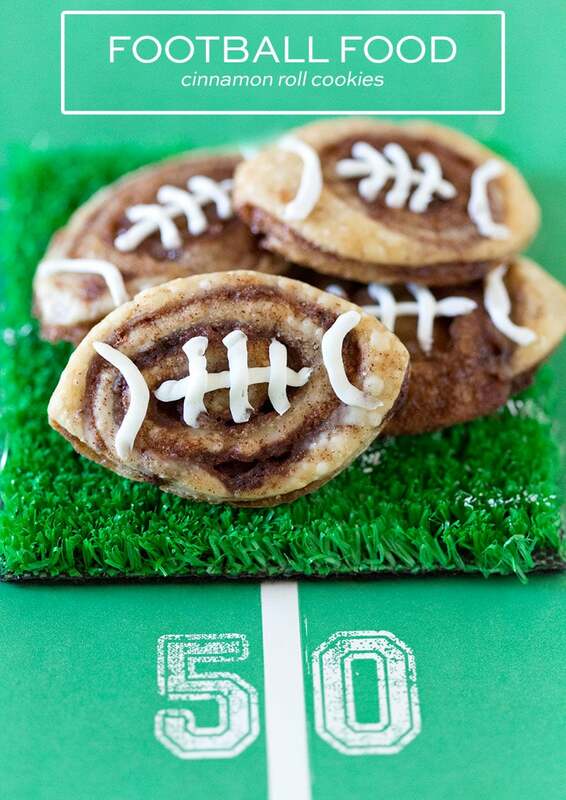 Kids and adults alike will love this tasty football treat! If you make this recipe or my other easy tailgate foods, be sure to share with me on social media! I’m @pizzazzerie on all channels. We tailgated this past weekend as a family. These would have been perfect to bring. So fun, Jenn! Thanks for the sweet comment! Oh, yum! I’ve tried unsuccessfully to make pie dough cookies before, but the method of rolling and flattening makes a lot of sense! Can’t wait to make these! I’m wondering, are the cookies pretty hard and crumbly or softer and more chewy? They were more soft and crumbly, is that a thing? :) Soft on top from the cinnamon and icing and then harder on the bottom. Unfortunately these cookies turned out absolutely horrible! First, it was way to much cinnamon and sugar! I would say you can cut this in half and even quarter the cinnamon amount. When it came to flattening the dough, after cutting into 1” pieces, it became a huge mess! Using the bottom of a glass did not work nor did a rolling pin. The cinnamon roll kept sticking to both and pulling it all apart. Also by flattening it, the ends broke apart leaving it jagged and not a smooth round cookie shape. There were also problems with the icing. There is no way 1 tsp. of vanilla extract would thin out 1 1/2 cups powdered sugar! I used one cup of powdered sugar and that wouldn’t even mix together. I had to add milk to help thin it. Even once it was thinned out the taste was not good! All you could taste was powdered sugar. This only made 10 cookies, not 16 as stated. Very disappointed as this looked like a cute recipe! I’m so glad to know that it wasn’t just me that these turned out in disaster for! They turned out horrible following the recipe. I tried to recover them but it ended up tasting like I poured the cinnamon directly into my mouth. The icing consistently was way off. Unfortunately I can not recommend folllwjnf this recipe. Super cute pictures but in reality, it does not turn out like this! I had the exact same issues as Lindsay described in her review. I ended up rolling the dough after cutting it and then flattening and cutting into the right shape. They still taste good but don’t have the cinnamon roll swirl effect. My thought is that maybe the ingredient amounts for this recipe are for 2 pie crusts instead of one. I think the proportions would have turned out better that way. Definitely had to add milk to the frosting too! Overall a really cute recipe idea though!